The U.S. Naval Academy is bringing in Google employees to provide voluntary "Transgender 101" training to midshipmen this week as part of an ongoing "safe space" training series. The academy's Center for Teaching and Learning is holding two events on Friday, one for faculty and staff and another for midshipmen. The hour and a half-long workshops will be hosted by Marnie Florin and Kevin Perry, who launched a similar session at Google in 2015. Midshipmen and staff who take the training course will get the opportunity to display cards outside their door that show they are allies of the LGBT community. The course was described in an email circulated by the Naval Academy on Tuesday. "On Friday, December 9, the Center for Teaching & Leaning welcomes Kevin Perry and Marnie Florin who will be presenting Transgender 101: Gender Identity in the Workplace," the email said. "Marnie and Kevin have given this workshop at Google offices around the globe to more than 2,500 employees." The email explained that Florin is transgender and uses the pronoun "ze." "Before Google, Kevin worked at Bank of America where he helped launch an LGBTQ ally program," according to the email. "Before Google, Marnie attended Columbia Business School and saw that people had a lot of questions when ze (Marnie uses gender neutral pronouns) came out as transgender. Kevin and Marnie teamed out to create the Trans 101 session with the hope that it would create more supportive and inclusive workplaces by helping people better understand the trans experience and what it means to be an ally to the trans community." "Attendees will receive door cards, which they may display if they wish, to indicate that they are allies," the email added. A Naval Academy spokesperson told the Washington Free Beacon that the training is voluntary and open to all midshipmen, faculty, and staff. Forty-three midshipmen and 80 faculty members have signed up for the two sessions so far. 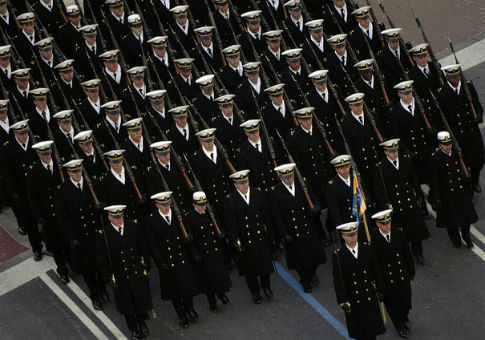 Karyn Z. Sproles, PhD, the director of the Center for Teaching and Learning, said there is a demand for "Safe Space" training at the Naval Academy. "Training is offered because we find that, like all Millennials, this generation of midshipmen is eager to become more educated about issues of gender and sexuality," she said. "There is a consistent demand by faculty, staff, and Midshipmen for ‘Safe Space' training, which is regularly offered by the Center for Teaching and Learning." "The opportunity to learn more about transgender allows us all to expand our understanding of this complex topic," Sproles said. The spokesperson said Google volunteered to present the training. The workshops, which are being paid for by the Center for Teaching and Learning with non-appropriated funds, will have minimal costs for transportation and lodging. Florin told the Free Beacon she is not being paid by USNA. "A USNA alum reached out to USNA to suggest Kevin and I come do a Trans 101 session," Florin said. "We are going just as Kevin and Marnie and not at all representing Google. We're very excited for the opportunity to spread awareness of the trans community and ways to support trans individuals. We appreciate the USNA taking the initiative to start this conversation." Florin is a "Diversity Consultant" who has given inclusivity trainings for YouTube, at Twitter's headquarters in San Francisco, and Google offices around the world, including Tokyo and Sidney. "Marnie, who identifies as gender neutral and goes by the prounouns [sic] ‘ze' or ‘they,' created their first LGBTQ training as a Peace Corps Volunteer in West Africa," according to Florin's website. "Marnie then worked for the Los Angeles Gay & Lesbian Center, where ze organzied [sic] and canvassed for gay marriage." Students at the Columbia Business School "were a bit confused and had a lot of questions" after Florin came out as gender neutral, prompting Florin to create the "Transgender 101" training. Florin was "really disappointed to find that the L.G.B.T. community at Columbia Business School consisted of so many white, cisgender men," with few transgender or lesbian students, according to an article published in the New York Times last year. "Marnie also worked with the school to get a gender neutral bathroom created and add an option other than male and female into the admissions application," according to Florin's website. The Navy recently updated its policy regarding transgender individuals serving in active duty. The changes went into effect on Oct. 1. "To remain the finest seagoing fighting force the world has ever known, the Navy needs men and women who are the right fit for the right job regardless of race, gender, sexual orientation, creed, or gender identity," the Chief of Naval Personnel Public Affairs said in a statement released last month. "Our goal is to ensure that the mission is carried out by the most qualified and capable service members. If the individual can meet the Navy's standards, they should be afforded the opportunity to serve." The new policy allowed sailors to officially change their gender in the Navy's personnel administrative systems, changed bathroom policies, and distributed training DVDs to commands. All active duty sailors must complete transgender training by Jan. 31, 2017. "There will be new modesty policies to allow for increased privacy in berthing, shower and head facilities, adjustment to language in the urinalysis program and adding gender identity to the military equal opportunity policy," according to the statement. "After careful review of the physical readiness program, it was determined that no change was needed to the current policy and that standards remain the same for all Sailors." Update 5:35 P.M.: This article has been updated to reflect comment from Florin. Update 6:56 P.M.: This post was updated to clarify Kevin and Marnie's role.